I needed to whip up something fast and easy tonight since we spent a few hours at happy hour. Pasta is always good for soaking up the alcohol, so it was the perfect option for tonight's dinner. 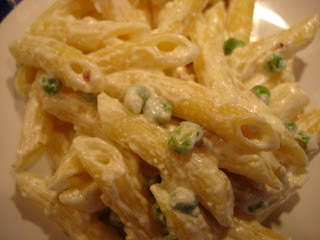 - Add the peas and cheese, stir until slightly thickened. If using proscuitto, add it now. - Add the pasta and toss. Top with some salt if needed. This dinner was delicious!! Quick and easy, and the perfect thing after a few drinks at the bar. this looks REALLY good...i've been in search of a good garlic cream sauce, i'm going to try this one. this would be easy to build off of...add grilled shrimp, chicken or other veggies. that may not be the best picture,but having had that before it sure does look good. california girl, I recently moved to Bangkok Thailand. It has been hard to remember some of the favorites from growing up...sometimes you need a foreighn dish. I think this sauce will go great with Ginooche's. This was AWESOME!!! I made it for myself last night for dinner. So quick and easy with ingredients I had on hand. I used tortellini instead of the penne, Riesling for the white wine and added prosciutoo. SO GOOD!! !